An all new bakery is now open for business in what once was White Box Café at 1215 N. Ruby, near Gonzaga in Spokane. The new bakery is called Lilac City Bakery and is a new locally owned & operated business venture from the same owners as Celebrations Bakery which remains open at their two locations in Spokane Valley and the Garland District. But, Lilac City Bakery has a bit more then Celebrations as Lilac City Bakery also has a limited food menu. The food menu includes good size panini sandwiches, soups and huge salads like a Mediterrian and a Southwest salad. But fear not as those with a sweet tooth with find more then enough goodies to keep them satisfied. They have cupcakes, cake pops, cookies, artisan breads , muffins, scones, cinnamon rolls and more all baked fresh. They are open 7 days a week Mon- Sat. 8-8 and 9-6 on Sunday and a small indoor dining area is provided. It's been 4 years now since the last meal was served in the former Shari's location at 1829 N. Monroe. The whole time since then the building has sat empty and waiting, attracting a few transients camping around the property but no real life. There even was a short lived plan to demolish the structure and construct a new Burger King but that planned fizzled quickly after learning of the conflictions that plan would have with city code in a pedestrian corridor like North Monroe. But, hope was not lost as LaShay and Lonnie Germain, owners of Top of the Line Burgers in Cheney closed their Cheney restaurant to open a cool new locally owned and operated place fittingly called Monroe Street Grill in the former Sherri's building. The new Monroe Street Grill opened for business back on the 11th and serve a decent size menu of staples like burgers, seafood , breakfast , hand breaded cod, chicken sandwiches and more in a family friendly environment. They also have a selection of beer and wine and some full dinner entrees including a Prime Rib Dinner on Friday nights starting at 4pm. I usually keep my opinions out of this blog but please pay them a visit as they have done a great thing opening a local business there and saving that corner. I'm guilty of going to Burger King every now and then but I'd much rather have this place on North Monroe then a cookie cutter fast food drive though any day! We are now under a week away from the opening of a new Jamba Juice location inside Spokane Valley Mall. This will be the first full Jamba Juice in Spokane, but not the first as a Jamba Juice station is also located inside Safeway at 2507 W. Wellesley. There is also a location in Coeur d' Alene at the Ironwood Square Shopping Center. The new Valley Mall Jamba Juice will be a small store on the second floor of the mall in between Auntie Anne's Pretzels and Rue21 ( suite 2126 ). The location franchise is held by LoKo Blending Valley who do have plans for further locations at some point in the future but this is the only confirmed location coming at this time. This new Jamba Juice will open for business at the end of this week. 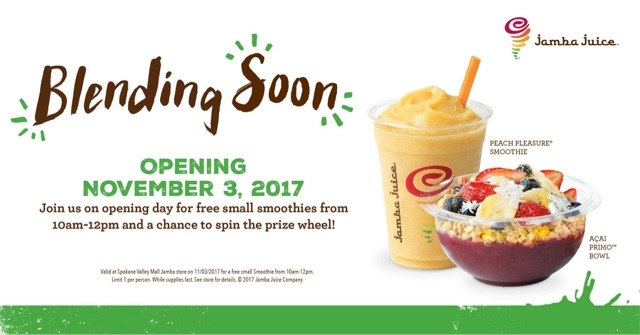 The store is planning an official grand opening on Friday, Nov 3rd with free small smoothies and 10am -noon and a prize wheel. The location will also have the brand's full menu of smoothies and bowls. Jamba Juice is a Frisco,TX based chain of quick service restaurants that as of last year has 885 locations. The company operates locations in 26 states but also the Bahamas, Mexico, Canada, Taiwan, South Korea and the Philippines. Almost all their locations are franchised. The Otis Hotel has seen better days. In fact in recent years the only life that the building, on the west end of Downtown Spokane, has seen is the not so lively zombie actors of the TV show Z Nation that regularly uses the property for filming. But, a few months ago the building got a new owner, Curtis Rystadt a Portland based developer who has hit the ground running with renovating the building which is at 110 S. Madison on the West side of Downtown Spokane. Shortly after Rystadt obtained the building it appeared the plan was to renovate the building into a new apartment complex. But, that is not that case we now have confirmation of what we will actually see soon at the Otis Hotel building. While the building has not been an actual hotel for sometime ( it was apartments before it became vacant ) the building will actually be re-opened as a hotel. Interior demolition is already underway which will be followed by several months of total renovation to convert the building into a franchised location of the Hotel Indigo chain. The developer has an ambitious plan to have the new hotel open in about 10 months but no set opening dates just yet. In all the new hotel will have 112 guest rooms and some space for retail / restaurants on the ground floor. This will be the first location of the Hotel Indigo branding in the Spokane area. The brand is a division of InterContinental Hotels Group and features boutique style hotels usually in larger cities. Hotel rooms feature murals and art and public spaces transform with the seasons and highlight the local area. The brand's largest competition is W Hotel and Aloft and they are usually classified as trendy. Founded in 2004 Hotel Indigo has 69 hotels open and several more under construction or in the planning phase. More complete details about this new hotel will be coming so watch for a separate post on that in the coming weeks/months. Although we don't have many details just yet we have been able confirm that the Flying Squirrel chain of indoor trampoline parks will remodel and open a new location inside the former Hastings store in Spokane Valley. This is the store that was in the Sullivan Square Shopping Center at Sprague & Sullivan. We'll post the details on this post once we get them, this is because Flying Squirrel themselves can confirm the fact they are planning a Spokane Valley location but haven't yet issued the location or opening date. Flying Squirrel also recently announced plans to open a location in another abandoned big box store over in Missoula and opened their first location in Calgary just a couple of years ago. Interestingly the company's website lists their corporate office as Coeur d' Alene ( although they don't show any locations planned there ). Past articles online indicate that Flying Squirrel Indoor Trampoline Parks include much more then just a traditional trampoline park. Some other attractions are often included and a 2015 article in the Spokane Journal of Business even says their locations have a full sit down bar and grill area. Many's Venezuelan Pizza is already one of Spokane's newest restaurants with their first location opening in July. But, now the cool new pizza place has added a second location out in Spokane Valley. Many's Pizza's original location is in the food court of River Park Square, they will remain open their but also now at 213 S. University Suite 1 . This is the same place that Cuppa Joe's coffee shop formerly was in and right next door to Just American Desserts. It features space to pick up pizzas to go and a dine in area. Many's Pizza Spokane Valley location has basic menu of specialty pizzas, build your own pizza, salad, breadsticks, lasagna and even a pizza burger. This menu appears to be a bit expanded over the location at River Park Square. And, as a Venezuelan restaurant they even have make a few items from Venezuela. Need a little extra help with math? Or, if your like me a lot of help with math? 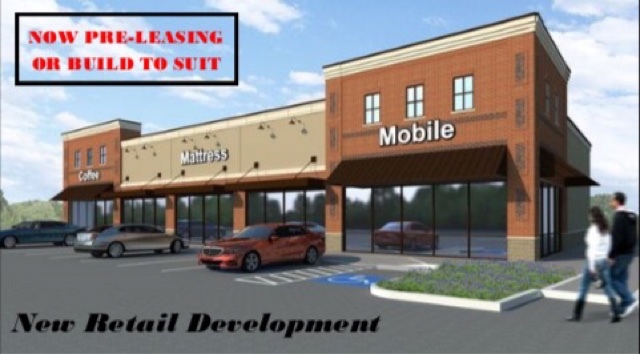 A new business that part of a larger national chain will be opening soon on the South Hill in the Lincoln Heights Shopping Center ( 2829 E. 29th Suite A ). That business is Mathnasium and staff are currently working of prepping the business that will occupy the space that was last used as one of Spokane's last remaining RadioShack locations. And, it's all to be owned and operated by someone some in the Spokane community may recognize. The owner is Jerry Post, who until soon has been the news director of KXLY 4 News and is married to Kris Crocker-Post an meteorologist also with KXLY 4 News. Mathnasium is growing chain of tutoring centers offering instruction specifically in all things math. The company is based out of Los Angelus and has over 700 locations in the US, Canada and a handful other countries around the world. On their website they say they help kids in grades K-12 understand math by teaching them the way that makes sense to them. The center will be open after school and on Saturday's and will help Spokane's kids get better grades and get further. First mentioned on this site as a project in development back in June 2016, it appears work has advanced significantly for a new strip mall at 513 E. Hastings Rd. in the Wandermere area. This would be on the north side of Hastings Rd. a short distance east of the Hastings / N. Division intersection. At the time we discovered the plan we we're told they wouldn't begin construction until they reached 65% leased. So, we find it interesting that it's now be marketed as ready by the Summer of 2018 but there is no mention of what tenants are coming there. The building will be a little more then 15,000 square feet and replace an eye care clinic that's currently in a stand alone building on the same parcel. It looks like that same clinic will actually relocate into as portion of the new building but that has not been confirmed. The new strip mall will have room for as many as 5 businesses and a parcel of land immediately to the east 525 E. Hastings Rd. is also available for land lease. For those that don't know what these posts are. Basically, I post and share a lot of posts about new businesses on our Facebook page ( http://www.facebook.com/inlandnorthwestbusinesswatch ) but many of those don't get mentioned on the main inlandnwbusiness.com site. Why? usually it's because I don't have enough info to do a write up on it so I wait till these posts to do a kind of re-cap. - Looks like something might finally be coming to the former Hooters in Spokane Valley. I don't know for what yet but the graffiti on the back is gone and it's all been painted and cleaned up. -The same people behind Celebrations cupcake bakery in the Garland District are planning a new place called Lilac City Bakery in the former White Box Pies space at E. Sharp and Ruby near Gonzaga. -A place called Chef Lu's Asian Bistro is coming to a storefront in the Lincoln Heights Shopping Center. Also, there Mathnisium is taking over the former RadioShack store space. - Pho Vietnamese Restaurant is coming soon to Liberty Lake in the space that was last Twisp Café coffee shop. I actually already posted about this but work is defiantly progressing on Geeks n' Glory gaming bar at 6710 E. Sprague in Spokane Valley. Downdraft Brewing in Post Falls is closing it's doors with a final weekend party planned for Nov. 17-19. Slate Creek Brewing Co, at 1710 N. 4th St #115 in Coeur d' Alene has also closed their door. The owners of the Spokane based trucking company TDR Logistics have acquired and will be re-opening Roller Valley roller skating rink at 9415 E. 4th in Spokane Valley. The grand opening will be this weekend!!! My Ipat which does PC & MAC repairs has opened for business in Spokane Valley at 9212 E. Montgomery suite 102 . Jaret & Joe's Automotive is now open for business in Nine Mile Falls at 6020 Hwy 291. Mt. Spokane Pediatrics is expanding and will open a new clinic in Spokane Valley around December or January in the office building at 11915 E. Broadway. Vanessa Behan Crisis Nursery has purchased and will soon move into the former SYSA Bingo Hall at 2230 E. Sprague Ave in East Central Spokane. Lilac Family Eye Care has opened for business at 23505 E. Appleway suite 106 in Liberty Lake. Spirit Pruners will re-locate their business to the historic former service station at 2425 E. Broadway in Spokane. The Mascot Pizza is a new pizza place coming soon to the former site of Ramblin' Road Brewing Co. at 730 N. Columbus in Spokane. Instant Tax Solutions is busy moving their HQ from Post Falls over to an all new building at 3829 Schreiber Way in Coeur d' Alene. Advanced Auto Parts has opened a new location in Spokane Valley at 4630 E. Sprague Ave. Eye Consultants NW has relocated their eye care / Lasik clinic to 9911 N. Nevada St. suite B in North Spokane. Jazzercise South Hill is moving to 2727 S. Mt. Vernon suite 3a . Serendipity Estates is a cool new estate sales place now open at 602 W. Garland in the Garland District. Orange Theory Fitness is working on opening a new franchised location to 410 E. Holland Ave. Suite E in North Spokane. Walker's Furniture has opened a new location in North Spokane at 7503 N. Division. Also, already posted about but Fuel Fitness will likely be opening for business pretty soon at 2641 N. Government Way in Coeur d' Alene. Andy Cline- Allstate Insurance is now open for business at 21950 E. Country Vista Dr # 400 in Liberty Lake. Resurrection Records has moved just a short distance is now in a larger space at 1927 W. Northwest Blvd. in Spokane. Pre-leasing is underway for a small new shopping center to be built at 204 N. Evergreen in Spokane Valley. The new center will be a 13,000 square foot structure to be constructed on land immediately north of the Wake Up Call Coffee and a bit north of the busy Sprague & Evergreen intersection. Construction will likely happen in 2018 but G. Arger Real Estate,Inc. has started pre-leasing the spaces. They are currently actively seeking both local and national tenants for the space which can be sub-divided for most any type of business, currently there are none to announce. The space is for lease at $18-$25 per sq. foot NNN and includes use of the on site surface parking lot. This space likely won't be empty for long as it has high visibility and allows businesses to custom design their own space. Spokane's restaurant scene has been getting noticed, even by Food & Wine Magazine who recently described Spokane as " long past ready for it's close up " . And, one of the prime spots for dining in Spokane is Kendall Yards. It will be called Park Lodge and will be a restaurant from Chef Phillip Stanton . Park Lodge will be chef-driven comfort food with an emphasis on seasonal and local produce. There will be a wide variety of menu items from traditional American cuisine to comfort foods from various cultures. We are planning reaching out soon to get for more info on the new Park Lodge restaurant so keep watching for even more info on that. Indaba Coffee will open a third location in coming months in the new building by the corner of Summit & Nettleton. Also, in that same building will be Hello Sugar a cool new donut shop. In the core of the Kendall Yards Business District is a new building called " The Bluff Building " which will house Fleet Feet and the new Maryhill Winery tasting room. But, also joining that building will be a new Sushi restaurant called Umi . A few more buildings are also planned in Kendall Yards including one of the largest buildings there yet nicknamed the Kendall Yards "podium" building so we expect many more new restaurants to be announced in the future. Keep watching this blog and our Facebook page for info on each of these new establishments as they open. Board & Brush is growing exponentially with new locations coming to cities all around the nation. Currently the Wisconsin based company has no locations open in all of Washington or Idaho, but that will soon change. That's because the company has secured a franchise owner to open a location here in Spokane soon. Board & Brush are instructor led wood sign workshops with wine. The company teaches customers woodshop techniques and skills while allowing them to take home a brand new custom wooden home décor sign. The concept is similar in a way to the popular paint & sip painting studios that are almost anywhere today. The franchise owner is currently developing the new Spokane location and hopes to have it open sometime in November. It will be on the South Hill at 1314 S. Grand Ave. suite 3 , in the same shopping center as Allie's Vegan Pizzeria & Café . Any updates on the new North Spokane Costco? Actually yes, it's looking like we will see construction sooner rather then later now as just yesterday the Spokane County's website shows the permits for the building and adjacent fuel station as issued. This means the contractor Lydig Construction will likely start work at the site very soon. No update on when it might open for business however. This new Costco is planned to be a 167,000 square foot store to replace a smaller store within the city limits on N. Division. The plan had also been held by a neighbor who filed an appeal of their environmental findings but per a recent article in the Journal of Business that has now been settled. What is going into the building at 57th & Mt. Vernon on the South Hill? About all I can say is... businesses ( big help I am, huh? ) . The building is a speculative expansion of the strip mall immediately to the east. It is a 6,900 square foot structure that has been under construction now for a while. It will have 5 business bays of various sizes but of course some businesses may take more then one space so it's hard to say how many businesses will open there. Currently all of the spaces remain up for lease with no one for sure planning to open there. However, I'm sure it won't take to long till we here of at least one new business there, and I, just like all of you are hoping for some new cool restaurant or something but we'll all be waiting for a little bit more time. Is there still a Popeye's coming to Spokane? After sitting in the line for over an hour last night to order at the newly opened Popeyes in Post Falls I think it's given another location is coming to our area. So yes, Popeyes is still planning a store on the northeast side of the N. Division / Lyons Ave. intersection in North Spokane. We reported in Feb. of plans in development for the first duel branded hotel in the Spokane market. Now we have received the details that construction is about the start on project which will be built on the West Plains and replace the dated Airway Express Inn at 3809 S. Geiger Blvd just off of I-90. Demolition will commence first on the Airway Express Inn first with construction on the new hotel likely to begin by the end of October. This new hotel will be both a Sleep Inn and a Mainstay Suites, a concept some companies are using more and more actively. The current plan is to have Sleep Inn / Mainstay hotel open for business by July of 2018. Construction will be done by Consolidated Construction Co,Inc a full service design/build firm headquartered in Appleton,Wi.. H&H Hospitality of Spokane is the owner and it will be operated by the Lighthouse Hospitality Group. - 87 guest rooms in 51,000 square feet of space. 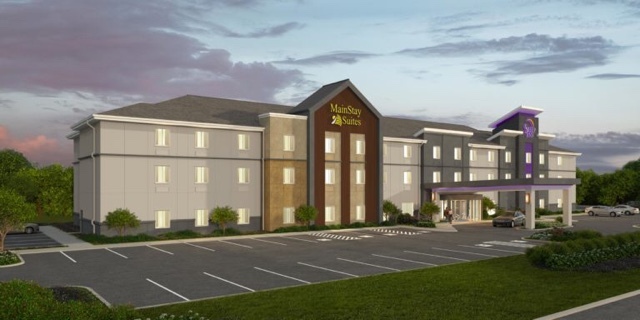 The hotel will have both the Sleep Inn and Mainstay Suites branded rooms under one roof ( about half/half room wise ) . But it will all be ran from one single lobby / front desk. Both brands are part of Choice Hotels a Rockford, MD. based company that has multiple other brands and over 6000 hotels worldwide in several different countries.